Two individuals face felony charges including delivery of a controlled substance and endangering the welfare of a child following an arrest that took place on Wednesday, Nov. 22. George R. Reading III, 32, and Alisa R. Gregory, 33, each of Bowling Green, were taken into custody following the execution of a search warrant at 1409 W. Centennial Street last week. Pike County Sheriff Stephen Korte said his department was assisted by the Bowling Green Police Department, East Central Drug Task Force and Frankford Police Department. Both Reading and Gregory have been charged with delivery of a controlled substance (methamphetamine), class C felonies, possession of amphetamine, dextroamphetamine and fentanyl, which are class D felonies. 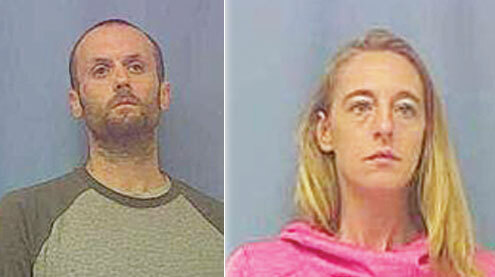 The pair was further charged with the class D felony of endangering the welfare of a child in the first degree. Bond was set at $25,000 cash, for each defendant. All persons charged with a crime are presumed innocent by the courts until proven guilty in a court of law.